Long Clawson footballer George Thomson is finding his goalscoring form on loan at the club set up by disgruntled Manchester United fans. The former Nottingham Forest trainee has been in fine form since joining FC United of Manchester on a month’s loan from Chester FC. The 23-year-old netted three times in five appearances for the National League North outfit in November and his parent club have agreed to extend the loan for a further month until January. 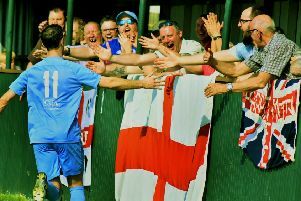 He scored last weekend in a 2-1 defeat to Gloucester City and in a 3-2 win over Nuneaton Town in the previous game, and also netted in a 2-1 loss to AFC Telford United in the FA Trophy.